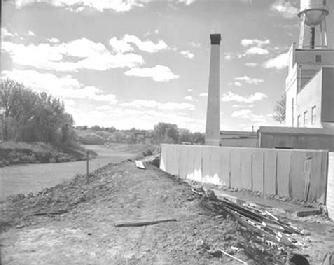 A flour milling operation was started in 1885 by a group of Massachusetts investors under the name of the Mandan Land and Development Company, This "Boston Syndicate" would invest heavily in the southwest area of Mandan; even today the district is frequently referred to as "the Syndicate." The flour mill would eventually be operated under four names under different owners during its lifetime: (a) Mandan Roller Mill; (b) North Dakota Millers' Association; (c) Missouri Valley Milling Company; and (d) Russell-Miller Milling Company. The Syndicate arranged for a rail spur to be installed down to the Heart River. After construction of a brickyard and building supply warehouse was complete, foundations were laid for a 200 barrel per day flour mill and grain elevator. The mill would be constructed from the product of its own brickyard. 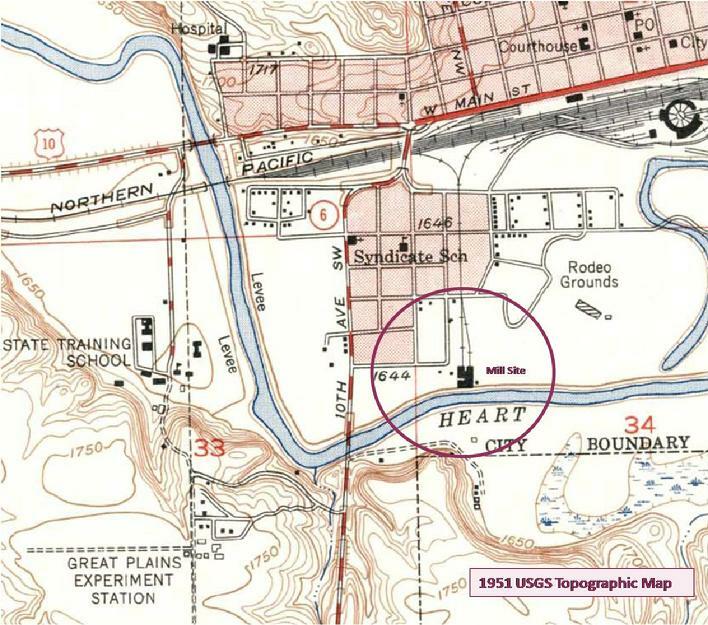 Strategically located between the Heart River for water and power, and leveraging its own rail spur connected to the Northern Pacific Railroad for transportation, the facility was a major employer for the city for over 50 years. It was among the first businesses to be electrified, with it's own on-site electrical generation equipment. In October 1887, The Mandan Pioneer reported, "Mr. E.E. Watson has just completed a big job of lettering the roof of the Mandan Roller Mill Company’s warehouse near the mill. The words ‘Mandan Roller Mill Company’ are painted in white letters twelve feet high and stretch a distance of 210 feet. They are well proportioned and look bold and prominent from the railroad tracks." In 1888, the mill signed a contract to provide the federal Indian agencies of the northwest with 1.3 million pounds of flour. The year 1891 saw many changes for the facility. In August, a new wood barrel-making operation began to supply the wood barrels to package the flour. Construction began on a warehouse addition to hold over 2000 barrels as well as a 50 thousand bushel grain elevator to the north of the mill. 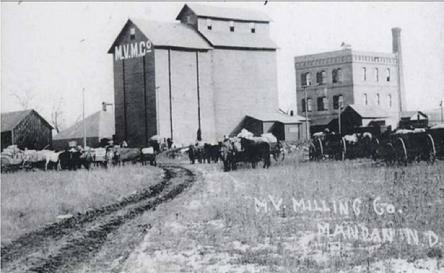 And later that same year, the mill was sold to the ND Millers' Association, a group of North Dakota-based banks and individuals. However by 1897, lawsuits were brought by the previous owners and banks for non-payment of loans. In 1899, Hiram Lyon together with then mill manager Benjamin Stephenson and partner John Newton bought the mill and organized the Missouri Valley Milling Company. Lyon served as president, Newton as secretary and Stephenson as treasurer. Its premium grade of flour was trademarked as "Lyon's Best" however its best selling brand was "Climax" flour. The company which had a potent influence on the industrial development of the Missouri Slope expanded rapidly. Originally capitalized at $50,000 in 1885, the investment topped $500,000 by 1909. Starting with a plant at Mandan with a daily capacity of 500 barrels, its mills in Bismarck and Dickinson gave the company a total output of 1200 barrels of flour per day. Their flour product took the grand prize at the 1904 World's Fair in St. Louis. Common in the day, the mill had a major fire on April 1, 1902 causing $1500 ($68,000 2013-equivalent) but was rebuilt and further upgraded. In June 1909, driven by overwhelming demand for its "Occident" brand flour, the large regional Russell-Miller Milling Company bought the Missouri Valley Mill Company mills at Mandan, Dickinson and Bismarck as well as its 17 grain elevators. The operations at the three North Dakota flour mills were upgraded to use process. Hiram Lyons assumed the role as corporate vice president as a result of the merger. John Henry Newton assumed the role of corporate Auditor while Benjamin Stephenson was appointed Western Area Manager. The Russell-Miller Company, which started from its operations in Valley City and later Jamestown, would go on to eventually become the country's fourth largest flour milling operations. Despite the new corporate image, North Dakota locations would continue to promote the "Climax" flour brand and associate its operations with the prior MVMC name. Plagued by intermittent flooding, as improved technology drove the economy of scale to consolidate operations, operations closed in 1956 in favor of mega-size facilities out of state. The buildings were demolished over the winter of 1963-64. The land was given to the City of Mandan for its use today as its maintenance shop and outdoor equipment storage area.